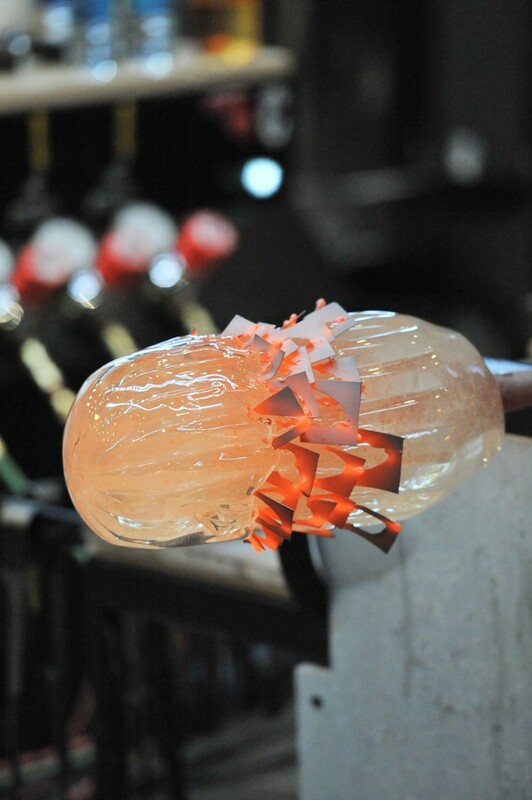 This post comes from Albert Paley, the first artist selected to participate in the Specialty Glass Residency Program offered by The Corning Museum of Glass and Corning Incorporated. 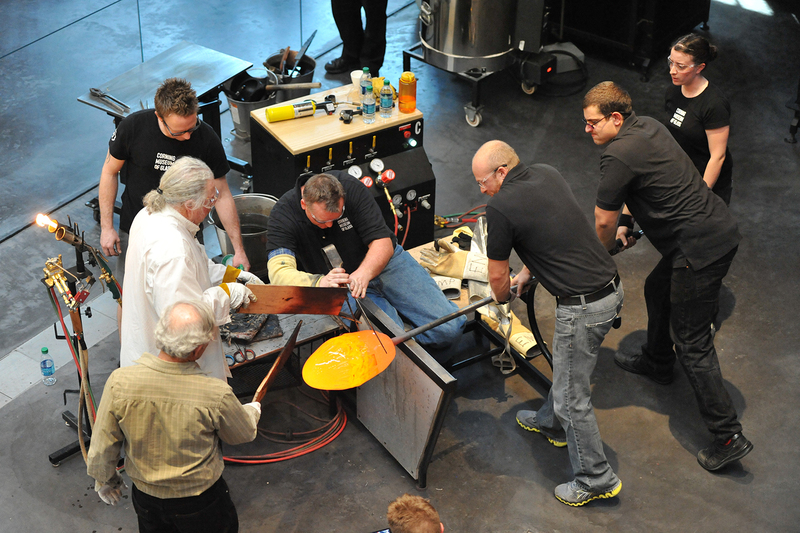 Albert Paley working at the Museum as part of the Specialty Glass Artist Residency Program. Over the past year my involvement with Corning Inc. as Artist-in-Residence has been quite an engaging, informative and positive interchange. In my own studio my primary involvement is with metal sculpture. The foundation of the process of art draws from many sources, ultimately resulting in a visual language reflecting one’s individual voice. Besides the aspect of introspection and one’s own personal dialogue, material and process affords the means of expressing those sensibilities. The broader one’s technical base and understanding of logistics coupled with material characteristics affords a realization and manifestation of one’s vision. My work over the years in metal has focused primarily on the manipulation of the material through heat and pressure – primarily forging and hydraulic bending. Because of this application the majority of my work reflects an organic context that deals with gesture, motion and complexities of transition. 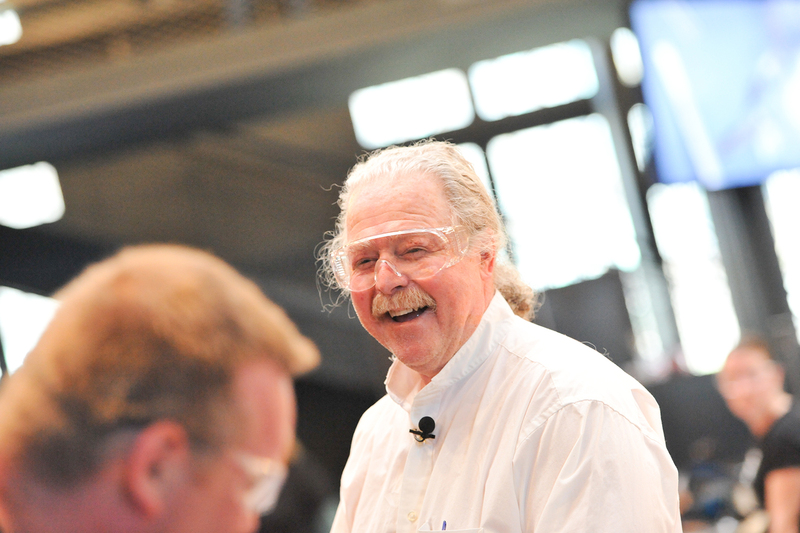 Prior to my involvement with Corning I had worked in several glass studios where I would engage in glass based on my understanding of plastic organic form. Although metal and glass are seemingly disparate materials the resulting form via their manipulation with heat becomes extremely sympathetic. Gesture and motion experienced through the forging of metal or the hot working of glass become stilled and frozen upon cooling. Although these are inorganic materials they express forms of the organic. Over the past several years I’ve developed a body of work which incorporates forms that I have developed in glass and supported them with metal structures. As Artist-in-Residence at Corning and being exposed to the various industrial glass characteristics, I was drawn specifically to the glass 7056 which has the property of combining physically with Kovar. Kovar is an alloy of iron, nickel and cobalt that has the same thermal expansion characteristics as the glass. Therefore these two materials become totally inter dependent during the working process. During the residency I was able to literally fuse my prior involvement into a unified language. Albert Paley and the Museum team at work. The work sessions at Corning were incredibly supportive of this research. In addition to the scientists and the technicians affording me the knowledge of the working characteristics of the glass, there is also the team of skilled glassworkers which I worked with directly in developing the individual pieces. My time at Corning was broken into separate individual work sessions. In retrospect these sessions became evolutionary in my understanding and sensitivity to the process. The initial sessions dealt with the fusing of glass and metal and then finally into developing stand alone objects based on that research. 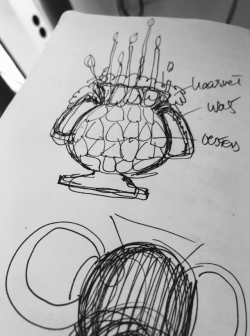 Some of the objects created, I would pre-form the Kovar into which the glass was blown and/or dipped. In other situations particles of metal were inserted during the various gathers during the blowing process thereby creating a visual matrix of pattern and interaction. At times during the working of the glass hot metal was dripped or poured into the glass creating a different type of pattern and fusion. A piece by Albery Paley in progress. As in all technical research there is at time bi-products that one would not have understood or considered but that is a result of the exploration process. The one aspect that I became fascinated with was the entrapment and the development of air through the heating and fusing process of the metal and glass. The dialogue then became the transparency of the glass, the opacity of the metal and the silver mirror like inclusions of the entrapped air. The air, seemingly evasive, develop patterns of direction through the hotworking of the glass, twisting, entrapment and spiraling. The exploration was limited to the development of form rather than color. In addition to the opportunity afforded to me by Corning Inc. the experience was extremely enriching and valuable. 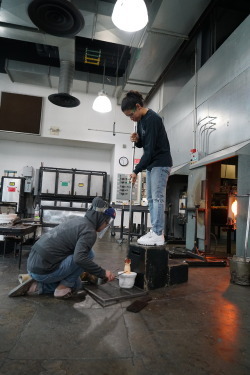 Much of my understanding of process and form development was enhanced during the engagement with the Corning scientists and the hot glass team. The resulting body of work that I developed during these sessions is quite unique and afforded me the opportunity to bring my previous artistic understanding of the combination of iron and glass into a new realm – unity and harmony of fusion. The process of exploration usually opens more opportunities and possibilities than one could have expected. The forum which was created at Corning as Artist-in-Residence was personally an enriching experience and hopefully helped define aspects of a visual language unique to this collaboration. Interested in learning more? 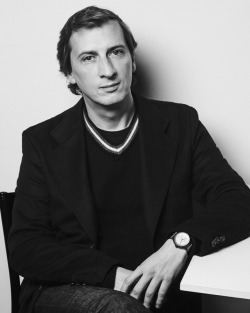 Check out Albert Paley’s Behind the Glass Lecture.